“It ‘s all physical, real. The wind, the sun, the time you have nighter”. Work on the installation by: 200 thousand cubes of high density polyethylene, covered by 70 thousand square meters of sparkling orange fabric. And an exhibition in Brescia on projects related to water. More than 50 projects of Land Art born from his artistic mind, 37 were never realized. Because it failed to obtain permits. But Christo this time promises to make us all walk on water. Is taking shape on Iseo Lake the impressive installation by the artist and his beloved wife Jeanne-Claude, who died in 2009, which will allow to walk on the lake suspended for three kilometers. The work that the public can go from June 18 to July 3. 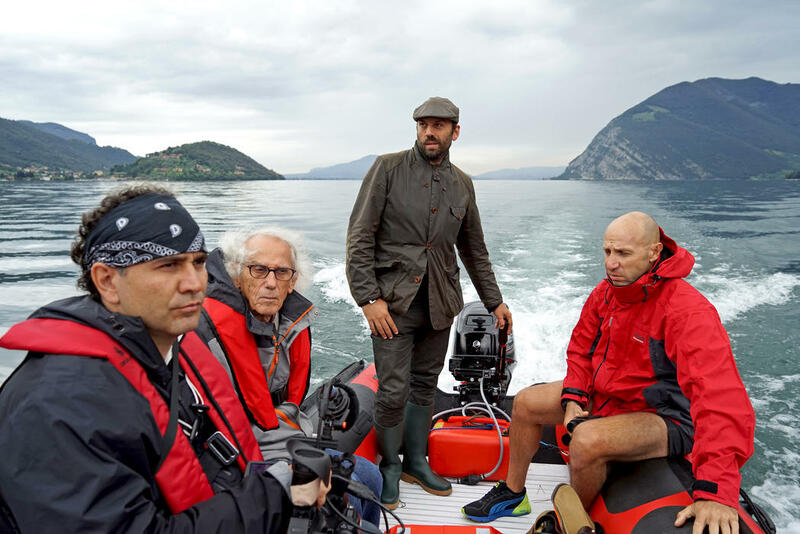 But from April 7, the fantastic adventure of “The floating piers”, ‘floating docks’, begins with an exhibition dedicated to the works drawings. To achieve it will be used 70 thousand square meters of sparkling orange fabric, stretched over a sequence of modular floating docks, 16 meters wide and built with 200 thousand cubic high-density polyethylene. 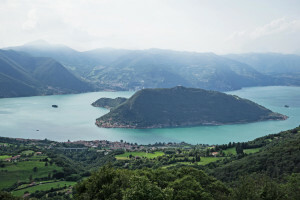 The route will wind between Sulzano and Monte Isola, between land and especially water, to reach the island of St. Paul. 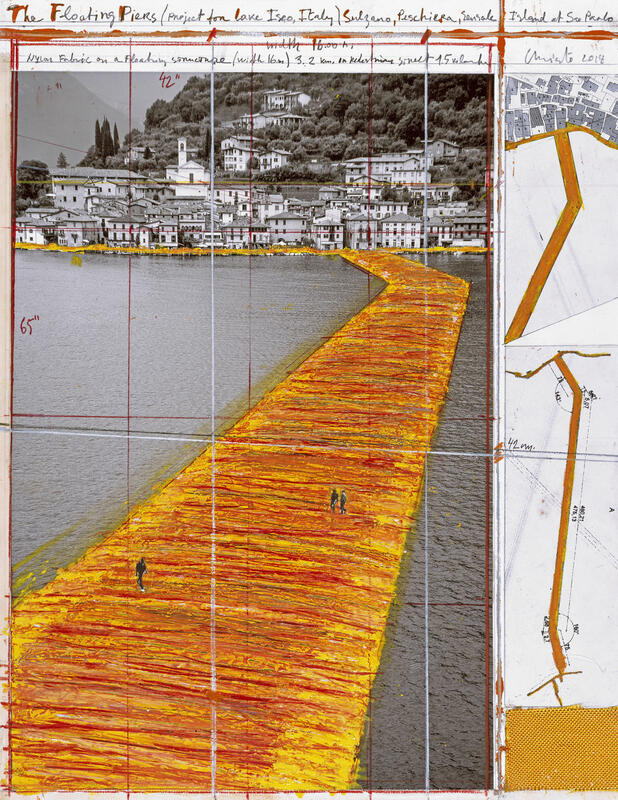 Simultaneously in Brescia, in the Museo di Santa Giulia, from 7 April to 18 September, they will be exhibited for the first time all of Christo and Jeanne Claude water-related projects. In Brescia are among 150 studies, drawings, collages on scale models, as well as video and film, relative to the seven Water Projects made in Australia, in Sydney between 1968 and 1969. 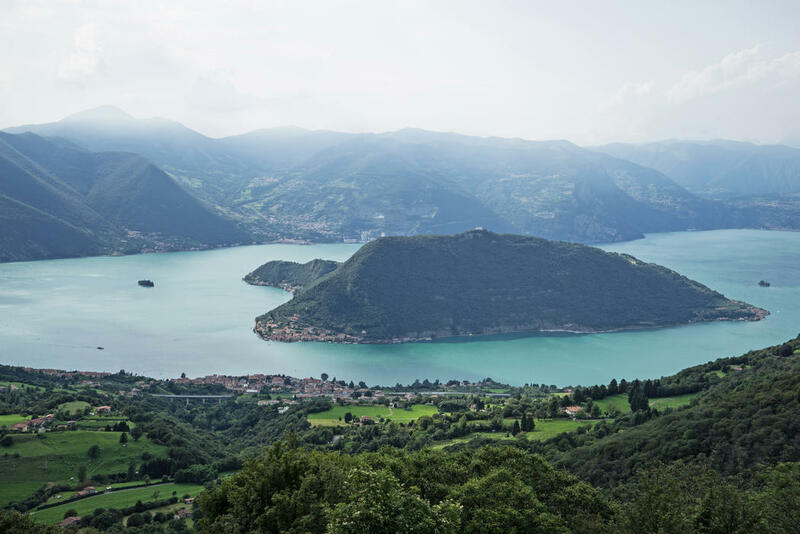 It will also be documented all the work related to the location on Iseo Lake, which promises to be the event of the summer. Hoteliers damage already sold out and great is the excitement. They are expected thousands and thousands of visitors; are 500 jobs promised by Christo, and also came lots of demand for fans and scholars who want to work for free. The work has cost 15 million euro. They were chosen the longest days of the year, with the greatest amount of sunlight. Thirty boats and lifeguards will ensure the safety of visitors. 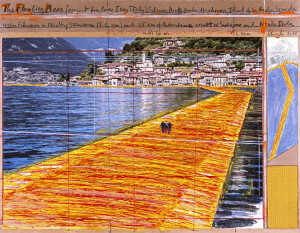 Signing always as “Christo”, the artist began to “package” with cloth or plastic objects of any kind, then move on to entire monuments. In Milan, in 1971, the largest event dedicated to New Realism, packed up the monument to Leonardo da Vinci in Piazza della Scala. He arrived to cover whole glimpses of landscape or city around the world. 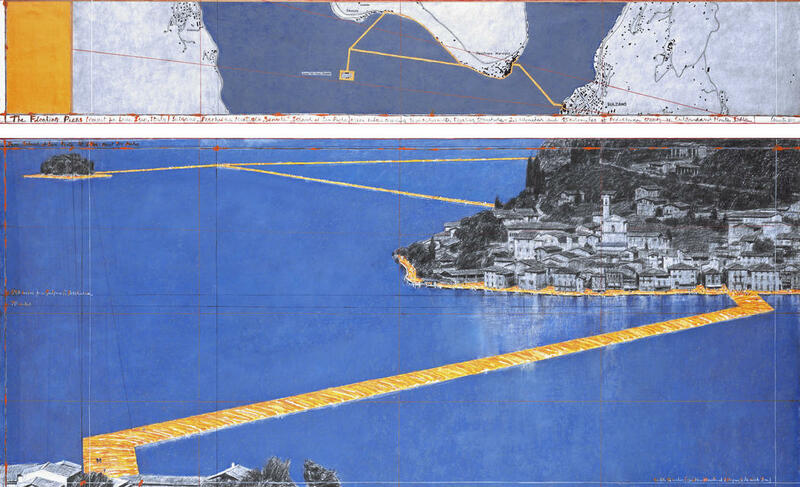 At curate the exhibition in Brescia, presented at the Triennale, was named Germano Celant, which describes the Christo and Jeanne-Claude’s work as “a click on the ratio of the urban plan” and frames it in the relationship between “environment” and “happening”. “A kind of art – explained the critical – which is close to that of the land artist, but it is not, because it is ephemeral.” An ephemeral that manifests itself in the limited duration of the works and also unable to collect them, if not in the form of preparatory drawings, but that supposes a giant underground work and often waits and frustrations. 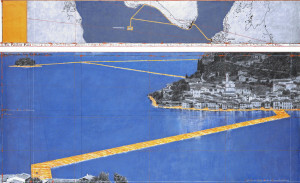 And that goes for Floating Piers of Iseo Lake, already imagined in the early decades of the artists. “The pier project – told Christo – born in that period, the genesis dates back to 1970, when we proposed the construction of small jetties in the delta of the River Plate in Argentina, but we did not have permission, it is broken down and came to a good progress in Tokyo Bay in 1996-97 and still we did not have permission. And we finally got permission to do so and now we begin in Iseo Lake. “In the exhibition of Santa Giulia, the space to document this ultimate dream come true.